The Trill are a race of symbiotic lifeforms native to the Alpha Quadrant. The hosts, as they are called, are a humanoid race with either characteristic black or brown spots visible down the sides of their neck or an odd forehead. These spots continue down the host's chest and all of the way down their body. The forehead type were only seen in one episode of Star Trek: The Next Generation. The spotted Trills appeared throughout Deep Space Nine. 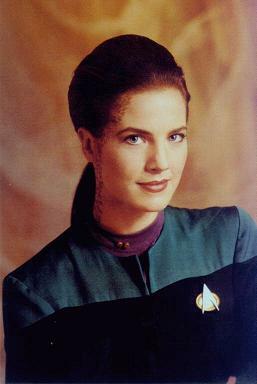 It is worth noting that the difference derives from a lack of planning surrounding the conventions of the species - whilst pre-filming for Deep Space Nine, several configurations of spot pattern were considered for Jadzia Dax, including makeup which involved a fake forehead. The symbionts are helpless, worm-shaped lifeforms who contain the memories of their previous hosts, and who inhabit the abdomens of the humanoid hosts. When a host and a symbiont are joined, the resulting individual is considered a new being. The Trill society is a complex and elitist one. Only joined Trills can be politicians and they take all the planet's decisions. When a host dies, the symbiont is transplanted into a new host. A symbiont who is neither implanted into a new host nor returned to their habitat (pools of nutrient-rich liquid on the Trill homeworld) will quickly die, as will a joined Trill host from whom the symbiont is removed after the first or second day. It was originally assumed that only a small fraction of the Trill population was capable of being joined, a myth which the Trill government continues to perpetuate. This is because the joining of the Dax symbiont with the host Joran (Curzon's predecessor), was a disaster - Joran was insane and a murderer. Joran's joining with Dax was covered up and all records of it were erased. The Trill government attempted to blame the failure on Joran's unsuitability as a host, but the truth was that Joran had passed the host screening tests and was technically a stable host - as was nearly half of the Trill population. The government dares not let this information become public, lest the symbionts become a commodity to be bought, sold and fought over by the public - as long as it is widely believed that only a small fraction can become hosts, the government reasons, then such widespread hysteria can be avoided. In rare cases, Trill symbionts can be joined with non-Trill humanoids, but the differences in biology means the results are often unstable. Commander William Riker was briefly joined to the Odan symbiont so that Odan could complete peace negotiations, and to keep Odan alive until a new Trill host could arrive. While this effort saved Odan's life, it nearly caused Riker's death. A joined Trill is known by the given name of the host followed by the name of the symbiont; for example, when Ezri Tigan was joined with the symbiont Dax, her name became Ezri Dax. Trill law forbids reassociation between subsequent hosts of joined persons who were romantically involved. Trills who are found guilty of reassociation are expelled from Trill society, and their symbionts die with their current host. The Trill have a number of special abilities that relate specifically to their Symbiont. -Due to the rigorous training program that prepares them for the 'joining' Trills receive an additional +2 pips to any one skill at the time of character creation. -Once 'Joined' the PC rolls a D3 to deteermine how many previous hosts the Symbiont has had before. -For each previous host the PC gets an aadditional +2 pips to distribute amongst Knowledge or Technical skills, up to a maximum of +2 pips in any skills areas. -Further...For each previous host the Trrill gets one template related specific skill from another template of the players choosing. The memories and lifetime of a previous host should not interfere with the duties and obligations of the new host. This is known as reassociation, a retrograde link strictly forbidden by the Symbiosis Commission. For once every personal obligation is carried on to the next host, there'd be no end to the debts and pledged from previous lifetimes. If such a disregard of Trill society occurs, both hosts will be banished from Trill for life, and the symbiont will die. Since nothing is as paramount to a Trill as the safety of the symbiont, the risks involved in reassociation make occurrences few and far between. Trill hosts voluntarily join with a symbiont, but once joined, both Trill and symbiont become biologically interdependent. After some 83 hours, neither Trill nor symbiont can survive without the other. The preservation of the symbiont's health is of paramount importance to the Trill, and if one must be sacrificed to save another, the Trill will invariably give up his/her own to save the symbiont's life. The most important gauge of the health of the joined Trill is the isoboromine levels. If it falls below 50, the symbiont will be removed from the Trill. Certain death awaits the host, but this is the standard policy for the Commission and is followed without question by all joined Trills. When Alpha's are joined their personality is completely Subjugated by the personality of the Symbiont. Beta's personality is not submerged by the Host after joining; the two separate minds merge, forming a new personality who is a combination of both the Host and Symbiont. This can cause severe psychological problems if the two minds are incompatible, resulting in rejection of the Host after only a few days - a rejection which often causes the death of the Host. The Trill are distant cousins to the Goa'uld, a race of force wielding aliens that have been known to subjugate planets and star systems under the thumb. The Trill are a kind and considerate race, although the Symbiont's are long lived the hosts are not. The race has only recently become involved in galactic affairs and joined the Republic Senate.